This is mainly a picture post for Lynn and Liz collating images of the Avengers Collection fur coats as worn by Pattie Boyd and Cynthia Lennon. 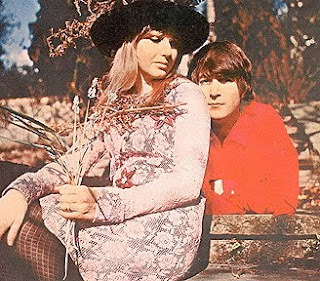 Also included are a couple of pictures of Pattie in a wedding outfit by the same designer, John Bates. This is one of the few times you'll have me posting on fur or feathers as I abhor the wearing of animal skins and am a card carrying vegetarian. 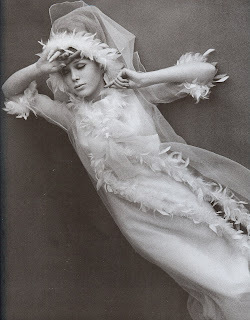 Fur and feathers in fashion break my heart. I love decadence but the sight of those two remind me of when my cat died and dead birds that my cats bring in. Needless to say, they do little for me but churn my stomach and are as far from indulgent decadence as I can get. 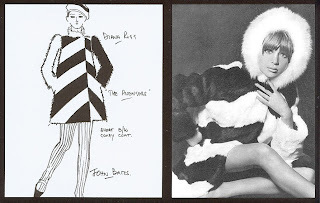 But it's fabulous to share the work of John Bates, a little mentioned fashion genius. And besides, what is there not to love about my fave rave girl from The Avengers and the Beatle girls? Pattie Boyd photographed for Vanity Fair in 1965 wearing a black and white rabbit fur coat. Shown with the original sketch for the coat by designer John Bates. Avengers star Diana Rigg modelling the same coat worn by Pattie. The outfits were originally designed for Diana, as can be seen noted in the design sketches. Also pictured is the cover for the Avengers Collection brochure which features another image of Diana wearing the coat in the centre. Cynthia Lennon photographed at the theatre in early 1966. Shown with the original sketch for the coat by designer John Bates. 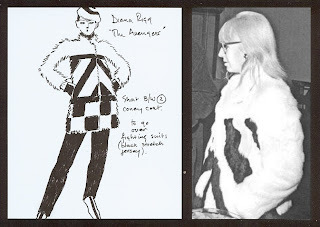 Diana Rigg modelling the same coat as worn by Cynthia Lennon. Back to the animal related fashion question. I have to admit to loving silk, but I have issues about the fact that getting silk kills the silk worms... so I make sure not to fund the practice and indulge my silk love via vintage and second hand pieces. I found the launch of the Yasmin Le Bon fashion range excruciating. Such beautifully made, gorgeous flattering items, and the majority in silk. Basically I stocked up on the non-silk pieces and have been grabbing what I can of the rest via the wonder of ebay. 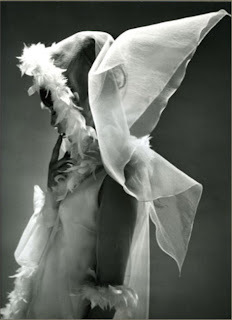 ...I still have mild guilt about the silk issue but it doesn't nauseate me like leather, feathers or fur. There's quite a few more images of Pattie in Varon knocking about Liz, so if you remind me I might get round to digging the others out. For the rest of the readers, if you want to indulge in further images from Pattie Boyd's modelling career, step across to Lynn's group at Yahoo http://groups.yahoo.com/group/pattieboydssixtiesstyle for the untimate collection because my website on Pattie's modelling career needs a major overhaul and I daren't even link to it at this stage. For more vintage fashion by someone who deeply loves the work of John Bates head over to Liz's blog http://emmapeelpants.blogspot.com/ or even stock up on some fashion history of your own at her online boutique http://www.vintage-a-peel.co.uk/ which comes highly recommended. I buy a lot of pieces there and have done for years. Every piece is sourced, researched, cleaned, repaired and then presented beautifully by Liz herself. And her prices are as gorgeous as the fashions she presents. She also does international postage so no-one is safe from her wonderful pieces. You have been warned. I love John Bates, as you know. But I have now TWICE rejected the idea of owning that coat when it's been available for me to buy. Yuck. My James Wedge hat is just about manageable because I can wrap it in tissue and hide it away. It's a shame, because the two things are practically made for each other but I can't quite bear to have a rabbit fur coat in my possession. What we really need is for the divine Mr Bates to re-make the exact coats for us in faux fur. I still dream of a day in the future when I can buy any fashion item I wish because they will all be leather/suede/fur free. 90% of myself tells me it's never going to happen, but a tiny part of me is ever hopeful. Any you're so right about the hat you have. Whenever I see it I think of the Avengers Coats.